Yeah, welcome to my Sunday morning. 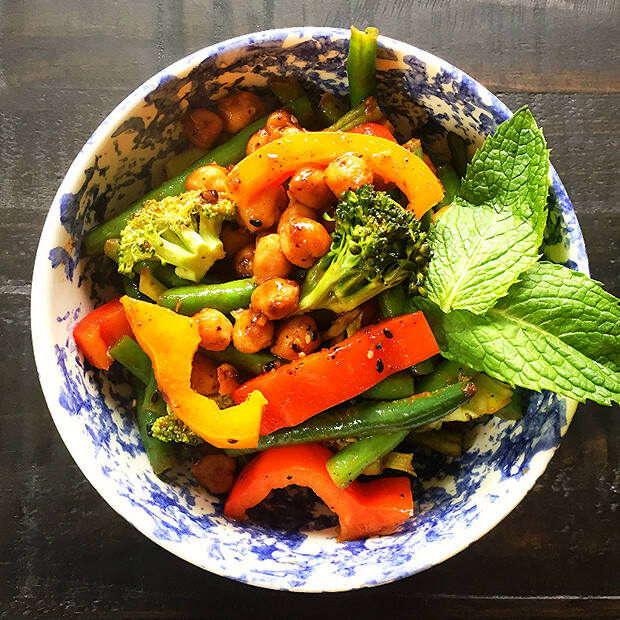 And welcome to the birth of my new favorite healthy vegan dish, The Sweet & Spicy Chickpea Stir Fry!! Get all your Asian inspired sauces out of the fridge, things are about to get Spicy… AND Sweet. I also found this amazing Sriracha Powder in the seasoning aisle at my grocery store and used the hell out of it in this dish. You could just use Cayenne pepper or RUN to your grocery store and find this Sriracha Powder Magic! Step 1: Drain & Rinse your chickpeas. Add them to a skillet with a little bit of coconut oil and start roasting them on medium high heat. You will have to shake around the pan often to make sure they don’t burn. Add your seasonings and don’t be shy. The chickpeas are the spicy part of your dish so don’t be afraid to add lots of heat. I used Sriracha Powder but Cayenne Pepper will work just fine too! Shake, Shake, Shake until these are golden and almost crispy looking. Step 2: While you’re shaking your chickpeas around; Boil water, add salt, & throw in your green beans. I cut mine in half first so they would be bite size. Boil these for no longer than 2 minutes. We just want to get the rawness out of them. Make sure they stay crunchy & VERY GREEN. Step 3: While your Green Beans are boiling. Throw your Broccoli florets in a pasta strainer and give them a good rinse. Pro-Tip: After boiling for 2 minutes, drain your Green Beans right over the Broccoli florets in the strainer. The steam from the boiling water will cook your broccoli just enough and the salt in the boiling water will season them perfectly. You will NEVER have to eat dead, limp broccoli again. Step 4: Slice your Bell Peppers in strips the same size as your green beans. Add to the chickpeas and stir around to get them cooked. 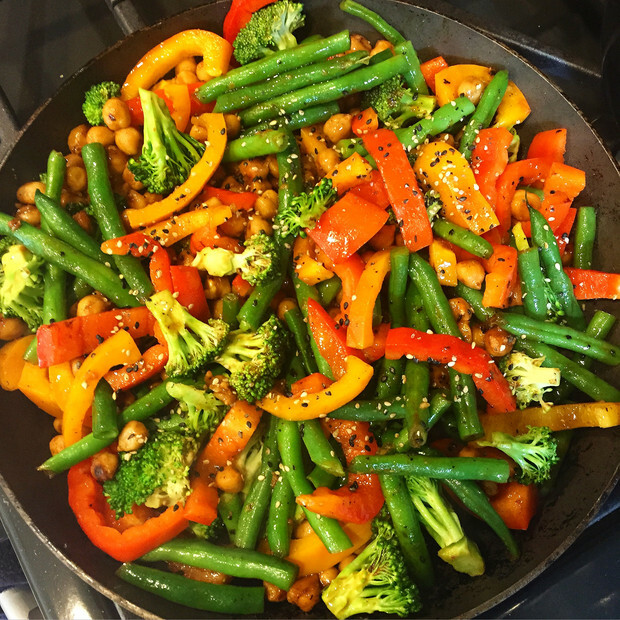 Step 5: Add Green Beans & Broccoli to the Chickpea & Bell Pepper mixture, stir more. Step 6: Let’s get SAUCY!! Drizzle in whatever you got. I used Stir Fry sauce, Sriracha BBQ Sauce, Sesame Oil, & a swoosh of Soy Sauce. Mix Well. Step 7: Taste. YUMMMMY, right?? 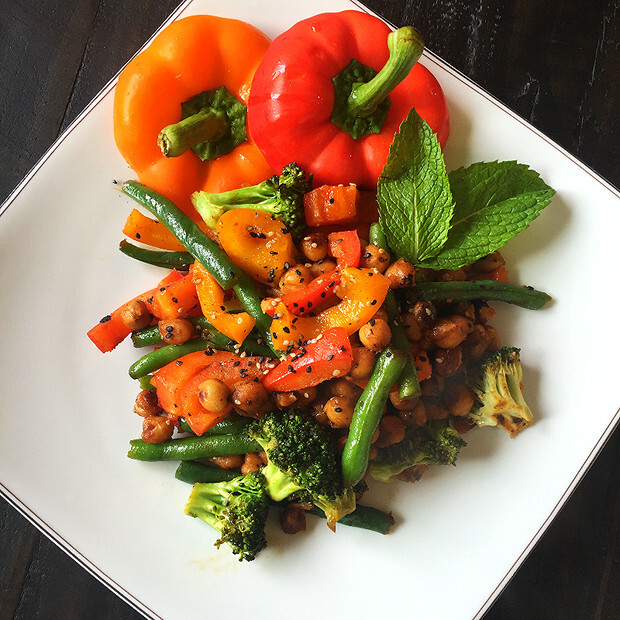 This stir fry would be absolutely fantastic over some brown rice but it was also just perfect as is.